Dowsing has existed in various forms for thousands of years. Originally it may have been for divination purposes, to divine the will of the gods, to foretell the future. During the Middle Ages the dowsing rods were used for the purpose of dowsing for the truth in trials but as it was in 1701 the inquisition stopped the use of the dowsing rods because they believed the process was associated with the Devil. Dowsing as practiced today probably originated in Germany during the 15th century, when it was used to find metals. The technique spread to England with German miners who came to England to work in the coal mines. Dowsing has been used to find sources of underground water and lost objects. This method has also been useful to map out the location of ley lines and energy vortices and is referred to as electro-magnetic reception. This process utilises the same senses that animals rely on for finding direction, food, each other and is also innate in every human being. Dowsing may be defined as the communication of subtle energies and information perceived by one’s extended senses and natural intuition with the focused “rational” mind through the use of a device, tool and or learned response. The unconscious mind detects far more information than it ever sends to the conscious mind. Dowsing rods operate on the theory that the unconscious mind can detect the subtle energy presence. Information received in this manner is of holographic nature, not limited by time and space, or the acknowledged physical laws of the universe. 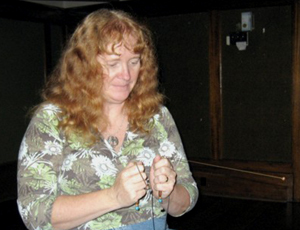 There are 2 common types of dowsing tools, pendulums and dowsing rods. A pendulum is an object that is attached to a pivot which the pendulum can swing freely. This object is subject to a restoring motion that will accelerate it toward an equilibrium position. When the pendulum is displaced from its place of rest, the restoring force will cause the pendulum to oscillate about the equilibrium position. A pendulum can be a metal or crystal weight hanging from a cord or chain. A common approach is that the user first determines which direction (left-right, up-down) will indicate “yes” and which “no”, before proceeding to ask the pendulum specific questions. The person holding the pendulum aims to hold it as steadily as possible over the centre. An interviewer may pose questions to the person holding the pendulum, and it swings by minute unconscious bodily movement in the direction of the answer. Dowsing rods are rods made out of wood or metals. Dowsing rods usually come in two shapes, L shape and Y shape. The L shaped rods are 2 L shaped wires, usually made out of metal preferably copper or brass, you hold one in each hand and their movements provide you with the information that you seek. 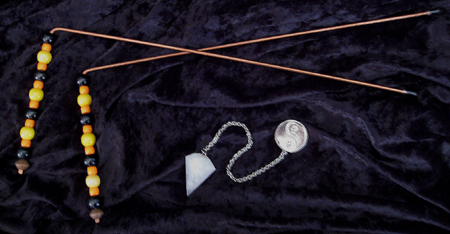 With dowsing rods, you will use the same technique as with the pendulum, but instead of rotating, the rods will open or cross to indicate a response to a question or will move according to the energy that it perceives. According to some dowsers who use divining rods, brass or copper are good conductors of energy and allows the rod to attune to magnetic fields emanated by the target without the earth’s EM field interfering, as would be the case with a metal such as steel. The end of the rod to be held by the dowser is often encased in a material that provides a constant electrical impedance, to prevent the dowser’s own conductivity from interfering with the dowsing process. Skeptics of dowsing believe that the dowsing apparatus has no special powers, but merely amplify small imperceptible movements of the hands arising from the expectations of the dowser. This psychological phenomenon is known as the ideomotor effect. Some supporters agree with this explanation, but maintain that the dowser has a subliminal sensitivity to the environment, perhaps via electroception, magnetoception, or telluric currents. 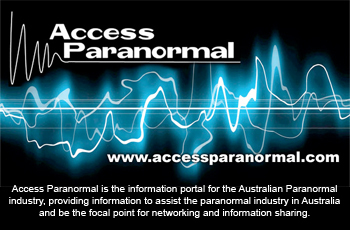 Others believe their powers are paranormal. Dowsing rods have been used for many years in paranormal research. Some researchers believe that these rods or pendulums can pick up on energy fields somewhat like an EMF Meter. Some also believe that by using dowsing rods, a spirit can control their movement by indicating “yes or no” answers by positioning the rods in different fashions or pointing the holder of the rods in a direction to lead them to a specific area. See Dowsing with L-Rods for more information. In paranormal investigations you can program the pendulum or dowsing rod using your intent to show where there is a concentration of spirit energy. With this method the pendulum will just hang until paranormal or spirit energy is present at which point it will start to oscillate and the speed and intensity of its movement correlates with the intensity of the energy as its movement will be strongest when directly over the source of the energy. With Dowsing Rods the rods will cross whenever you walk over an energy vortex or concentration of spirit energy. Ideally you should be specific as to which type of energy you’re seeking. You can also ask the dowsing rods to point you in the direction of the spirit energy. You don’t need to have any particular talent in using dowsing rods or pendulums but the quality of dowsing efforts do vary, depending upon how one approaches the activity. Over time with practice one develops one’s own intuitive apparatus through an extension of one’s natural feeling and intuitive perceptions.